The action research positively demonstrated that students were more engaged when using a digital tool to respond to their nightly reading. Below is a student example from their old paper reading log. As is evident in the photo, this student only responded two out of the four days required and did so sloppily and left boxes incomplete. The majority of students improved their writing and participation when they began blogging. As you can see above, this student not only wrote more, but gave more details, made predictions, and even gave a recommendation about the book. He demonstrated reading comprehension. Many other blog entries showed engagement by using words such as: “connected,” “differences and similarities,” “powerful,” “enjoy,” “again,” “hopefully,” and “like.” These words told the researcher that students were enjoying what they were reading and were anxious to get back to reading their books. Students also made connections to something in their life, to another book, or to one of the characters. Not only was it common in their nightly blogs, but it was also evident in their comments made to other classmates. 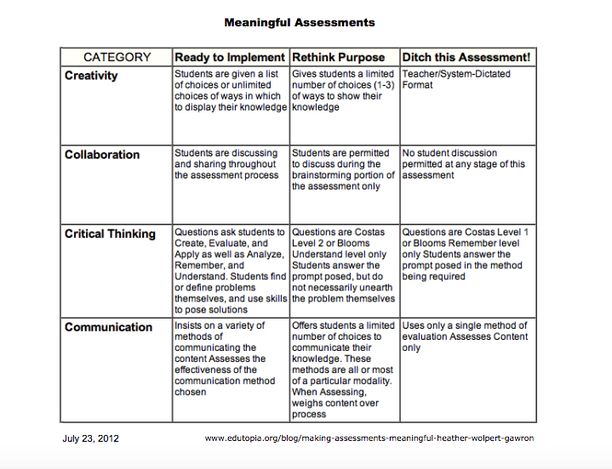 As stated in the article in Edutopia titled, "How Can We Make Assessments Meaningful", "The key here, however, is to assess every day. Not in boring, multiple-choice daily quizzes, but with informal, engaging assessments that take more than just a snapshot of a student's knowledge at one moment in time." 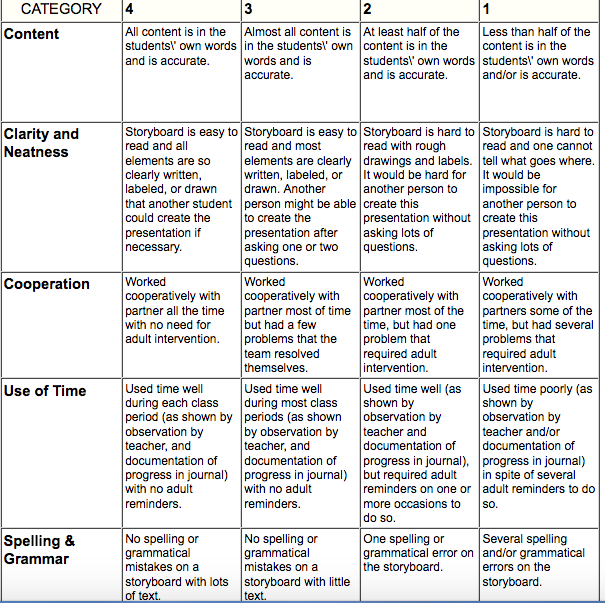 Below is a rubric designed specifically for a project on storyboardthat.com where students are put into partners to create a narrative story about a day in the life of a Native American from the Great Plains region. If you click on the button above titled Rubistar you can create your own rubrics for free. 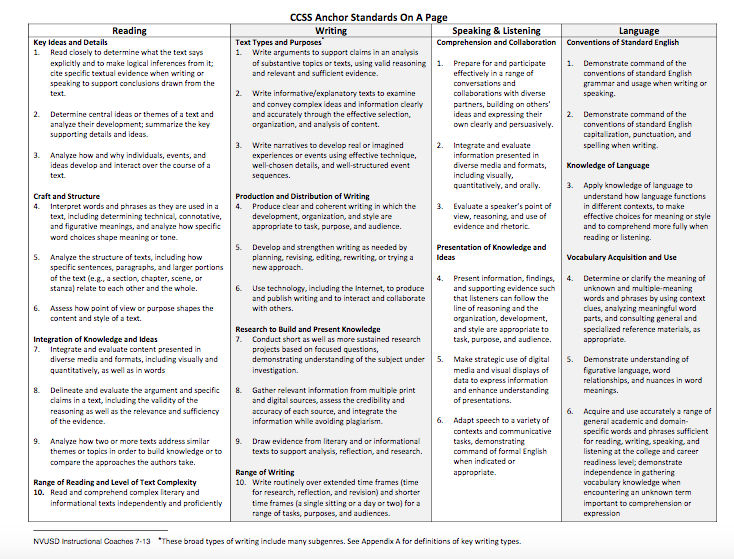 When it comes to assessing student blogs it is important to refer to the CCSS writing standards. Let the standards guide what you will be teaching and assessing through the blog format. Always "backwards plan". To see individual grades standards for NVUSD writing click on the image below. Click on either image to take you to Kahoot.it and Padlet.com which are two very useful websites that can be used for assessment. ﻿Click here for a sample Google Form survey to find out where your staff is with their technology comfort level. This survey will allow you to get started in determining the needs of your staff. Then, you can make a plan for what and how you want to teach them.